Renewable energies are sources of clean, inexhaustible and increasingly competitive energy. They differ from fossil fuels principally in their diversity, abundance and potential for use anywhere on the planet, but above all in that they produce neither greenhouse gases – which cause climate change – nor polluting emissions. There are many forms of renewable energy. Most of these renewable energies depend in one way or another on sunlight. Wind and hydroelectric power are the direct result of differential heating of the Earth’s surface which leads to air moving about (wind) and precipitation forming as the air is lifted. Solar energy is the direct conversion of sunlight using panels or collectors. Biomass energy is stored sunlight contained in plants. Other renewable energies that do not depend on sunlight are geothermal energy, which is a result of radioactive decay in the crust combined with the original heat of accreting the Earth, and tidal energy, which is a conversion of gravitational energy. 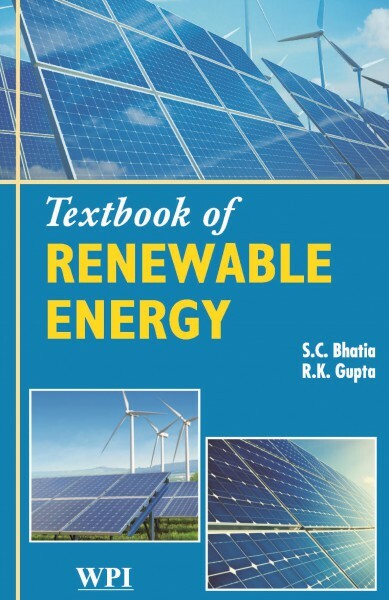 This book summarises various aspects of renewable energy and is divided into 16 chapters. This edition discusses renewable energy, solar radiation and its measurement, solar thermal energy conversion system, solar photovoltaic systems, biogas, biomass, biofuels, wind energy, fuel cells, tidal energy, hydrogen energy, geothermal energy, ocean thermal energy conversion, renewable energy applications in developing smart cities, environmental aspects of electrical energy generation. A unique feature of the book is chapter on magneto hydro dynamic power generation.